There are a few rare games out there that force you to play them; once you lay down that cash, you're sucked in until you finish. Sure, many games have great stories (Final Fantasy X), and some have great game play (God of War), but few combine both into something so special that you just can't quit. One such title this year that shouldnât be missed any adult gamer looking for a bit of adventure.. The game creates an intriguing story, but itâs the gameplay that makes the story come alive. Too many games these days have stories that aren't connected with the actual gameplay, but rather just feature boring cut scene movies--which the typical ADD gamer (such as myself) doesnât really like to sit through. 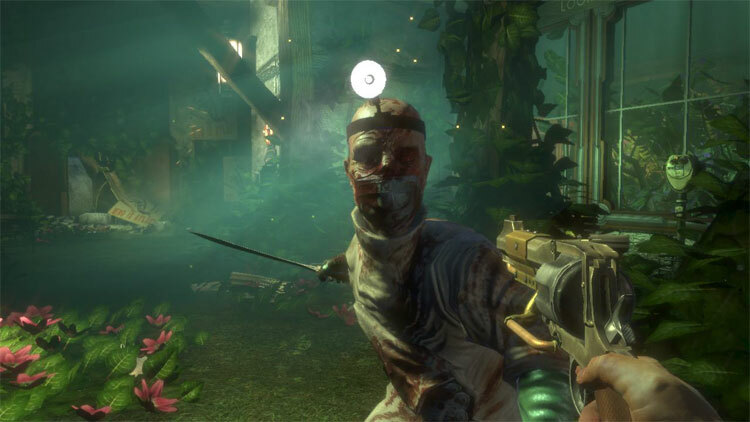 Bioshockâs story is delivered mostly through audio, which is transmitted to you via radio, so you're listening to the story while shooting, dismembering and electrocuting baddies through Bioshockâs Levels. The story of Bioshock was so intriguing to me that when I was getting an important message from Atlas concerning his family, I found myself telling my roommates to shut the hell up. The only cut scene in the game is found right at the beginning when your plane crashes. The moment you surface, your character gasps: I did the same, though I was gasping at the amazing water and fire effects. 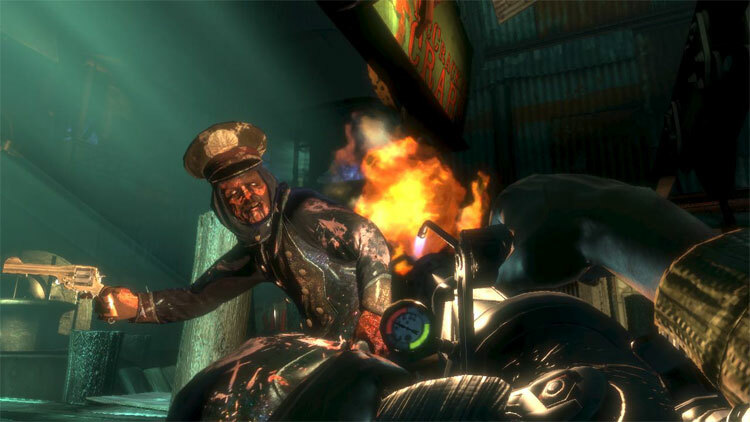 Even before entering Rapture (the main setting), you are nervously anticipating whatâs to come. In a nutshell, the story behind the game is that a somewhat mad man created an underwater civilization where rich people, crazy artists, and mad scientists can live in peace. Of course, things go wrong as people start to crave a substance called adam, which provides them with ungodly powers. Soon this whole âworldâ starts to freak for this substance adam. Common people follow no real rules to society and become mindless killing machines known to us merely as splicers. Girls known to us only as "little sisters" use a special needle-like tool to take the adam straight from victims' heart. Big Daddies protect the little sisters; they look like 1950âs navy divers with big suits and huge drills. They donât attack without being provoked, thankfully, but you will not be able to resist the urge to attack them. You'll be craving adam soon enough, no better then a crazed splicer. The Big Daddy fights present a challenge and a chance to get creative. After fights you are given the chance to harvest the little sisters or rescue them, these decisions play out in the end of the game and give the game some definite replay value. Bioshockâs variety of plasmids is where a lot of the games strength lies. There are so many weapons, powers, and other things you can use in Bioshock that no fight is ever the same. As for weapons and power (called plasmids in Bioshock), they're a blast to use. All the guns in the game have a cool 1940âs feel to them and are pretty powerful in the beginning. The first gun you get is the pistol, and it has some nice stopping power at short range. Head shots can turn splicer heads into red Kool-Aid pretty easily. The shotgun, my weapon of choice for taking down those nasty splicers, has a nice spread of fire. All guns can be upgraded, and all can use three different kinds of ammo. The shotguns exploding 00 buck is hard to come by but nasty fun to use. The pistolâs anti-personnel ammo can cut up those splicers fairly easily. 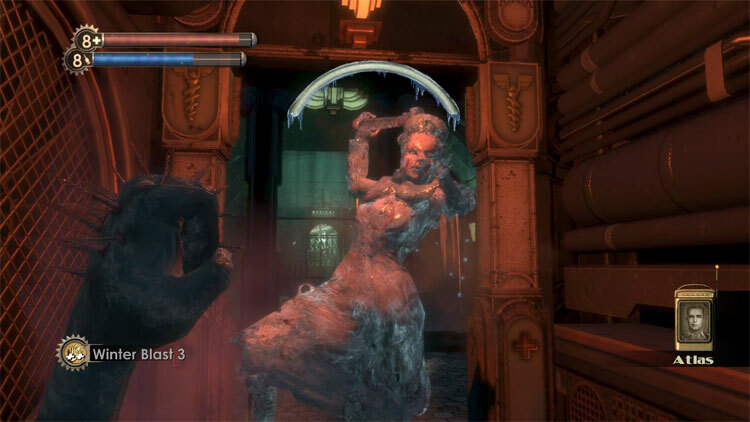 The difficulty with Bioshock lies in its resource management. You must plan how to use what equipment as effectively but more importantly efficiently as you can. Plasmids are some fun good fun, too. My personal favorites are winter blast, swarm of bees, and telekinesis. Using them together creatively is the best. I like to set my target on fire, watch him try to jump into water, then send an electricity blast through the water. Or light a table on fire, then chuck it at someone. Or how about freezing your enemy, surrounding him with mines and gas tanks, then when they thaw out, blow em up. Killing really shouldnât be this fun. There isn't much more I can tell you about Bioshock that isn't a spoiler, but I can tell you that it feels like youâre in rapture. Bioshock defines next generation gaming. Its artistic graphics and art-deco style cannot be compared to most games. The audio is what really makes the game come alive. The ambient sounds and old music are what make you feel in game. Every piano key plink and bullet ricochet feels and sounds appropriate. The money you spent on your Xbox 360 or 4 thousand dollar gaming computer will certainly feel justified, at least while your playing. 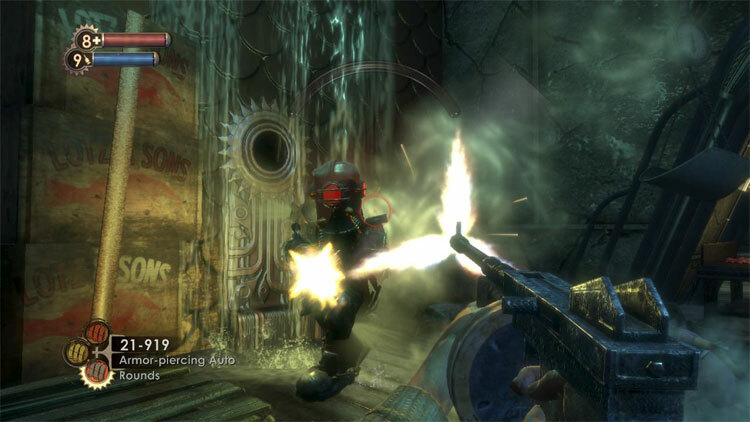 Bioshock is well-designed game that most adventure, horror, fps, and action fans will appreciate. The game isnât meant just to be played, but also to be experienced. If your lucky enough to read Maxims review(or should I say unlucky) they truly disgraced the game with a 3/5 rating. No offense to Maxim fans but maybe keep the meat-heads out of the games department. As a non steroid user I feel this is a possibility for game of the year. [I think itâs not that theyâre meatheads, itâs that they donât play the games and just rate the press releases and trailers. MDS] Currently I donât believe there to be a better single person console shooter experience for any system, Bioshock is an experience not to be missed. A great game.